Wish it could be Christmas every day? Treat yourself to some beautiful chandeliers and home lighting you can enjoy all year round! We all spend a lot of time and care at Christmas, be it with thoughtful gifts, spending time with friends and family or by carefully selecting the perfect outfit for each occasion. We are more likely to invite people into our homes at this time of year than at any other, so it’s a perfect opportunity to treat your home to show stopping light fittings. Lighting and festivities go hand in hand; Festive lighting is a nice little touch but ensuring that your home has all year-round quality lighting should not be neglected. Here are a few lights to add sparkle to everyday! Colours and trends in home lighting design may come and go, but one look that is guaranteed to be timeless is the decadent sparkle of crystal and glass lighting that echoes through the ages from historic, regal portraits to the contemporary ‘bling’ we see today. Crystal Chandeliers can be reminiscent of the icicles glistening in the pale winter sun or fresh snow glittering underfoot. Crystal and glass lights effortlessly compliments all settings and colours whilst adding a luxurious shimmer which lifts interiors to an extraordinary glamorous style no other material could hope to emulate. Traditional Chandeliers were made to demonstrate wealth in palaces and affluent manor houses with intricate detailing designed to glitter with brilliant radiance in the candlelight. Chandeliers have remained popular through the years with the styles on offer morphing with the current trends of the eras, ensuring that there is a perfect selection on offer to collaborate with all styles and ages of properties. 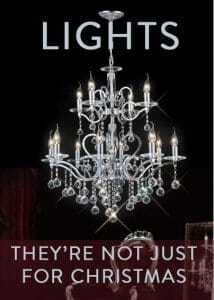 The Lighting Company has an extensive range of both Traditional and Modern Chandeliers to suit any budget. 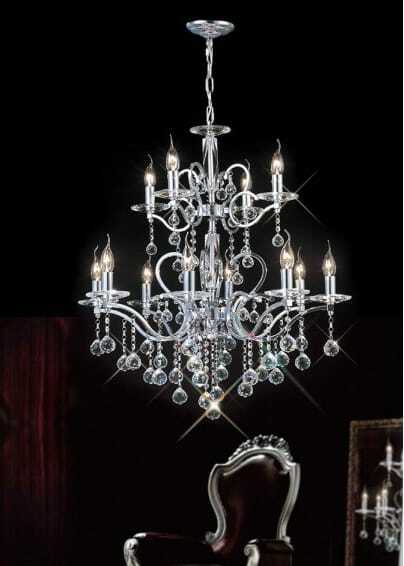 A most impressive chandelier with real lead crystal that is ideal for high ceilings. The chandelier can be used with candle bulbs as shown in our picture or with the addition of candle shades which can be chosen to co-ordinate with decorations in the room. The chandelier is attached to the ceiling by a circular polished chrome rose and suspended on a link chain. The chain can be shortened when fitting to ensure the correct height. The polished chrome frame has square section curved arms that support the 12 candle style lights. Each light has a crystal sconce and a polished chrome candle drip. 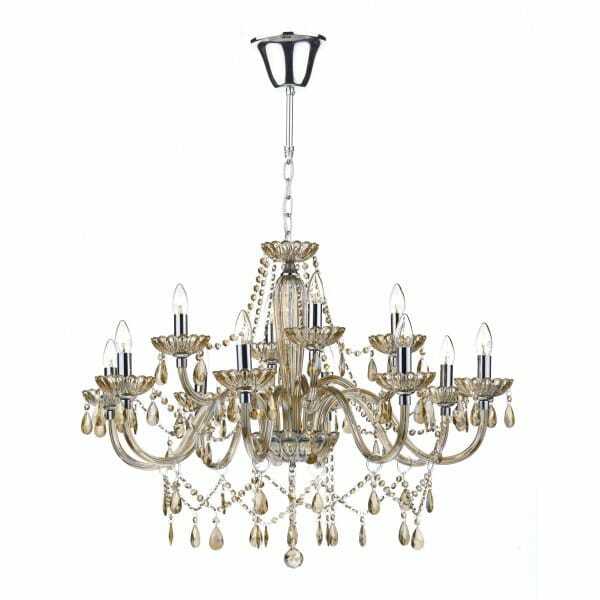 The chandelier is dressed with crystal beads and spheres and has faceted crystal columns. The crystal used in this light is Asfour 30% Egyptian lead crystal. A large 12 light chandelier in a champagne gold crystal finish, suitable for use in any setting and ideal for lighting in rooms with high ceilings and areas with long drops. The light is double insulated to allow for safe use without need of an earth wire and is height adjustable at the point of install making it suitable for medium to high ceilings. A great feature light for a reception, hall or staircase. Fast forwarding from candlelit manor houses and palaces, the first major leap forward in terms of design came with a huge desire to impress modernity in the golden eras between the two World Wars. Art Deco boomed in popularity, with intricate design being replaced by strong, geometric styling. Whilst art glass used in the beloved Tiffany lighting was prolific, many who weren’t as confident with the bolder colours turned to mirrored glass and prismatic crystals to inject the contemporary style of the era. 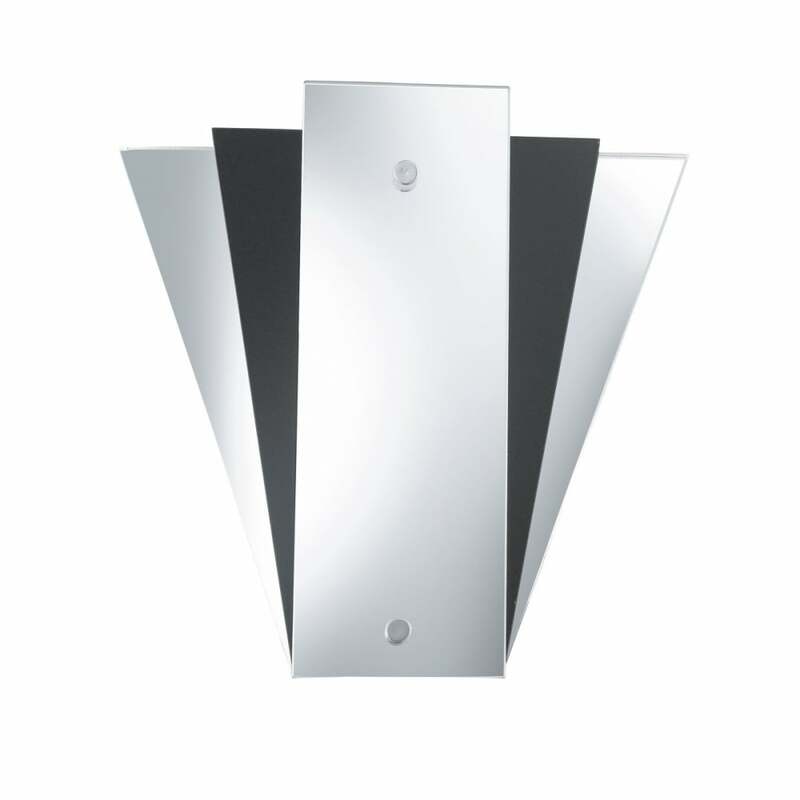 A fan styled wall washer light made up of mirrored and black gloss panels create an Art Deco appearance. Providing an attractive source of light and shadow this wall light would be ideal for lighting in any Art Deco or contemporary living space. Today, we see an enormous number of modern and traditional styles of using glass and crystals in our lighting, catering for all tastes, budgets and size requirements. For a subtle shimmering light, clear cut-glass or prismatic glass will offer a smooth, understated silhouette into a room. Refracting the light, the illumination will glitter through prettily, avoiding glare in the eyes. 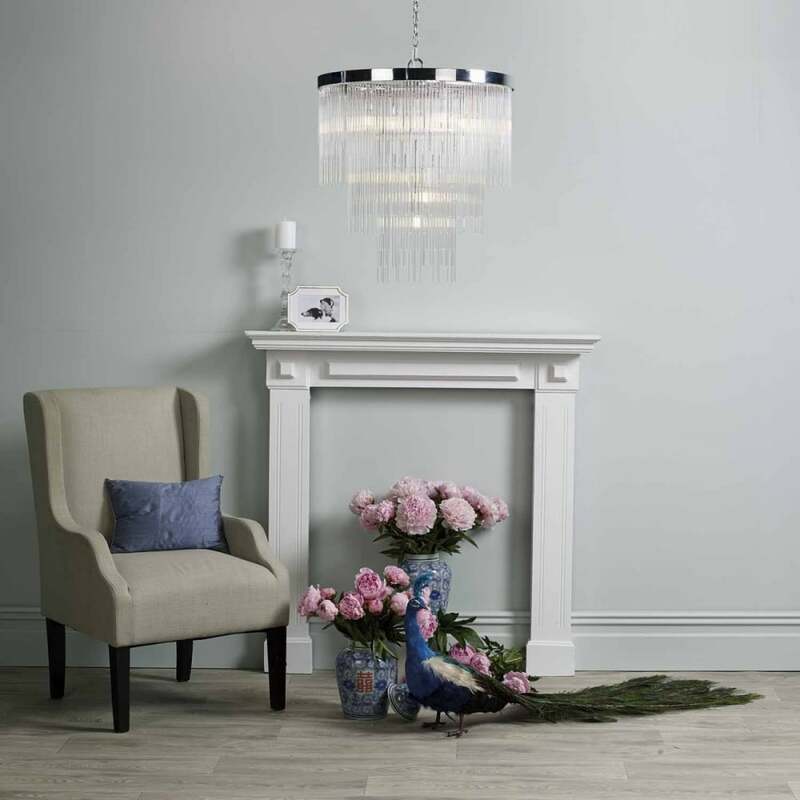 A contemporary design 5 light ceiling pendant cluster in a polished chrome finish with beautifully cut glass shades. The elegant chrome caps blend perfectly into the glass shades and can be height adjusted at the point of installation for use in rooms with lower ceilings. 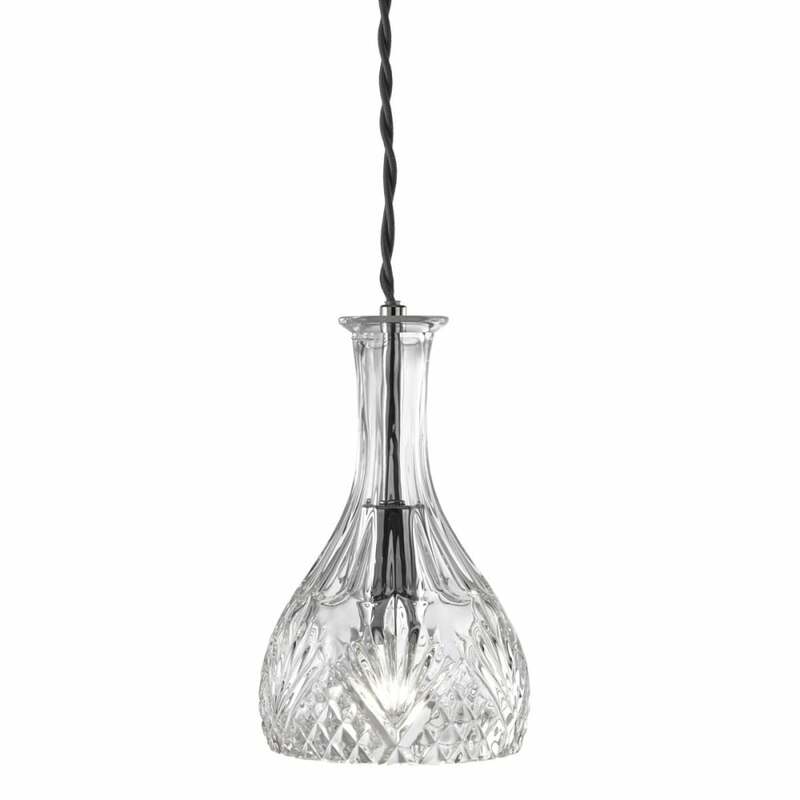 This pendant is sure to add sparkle to any modern setting and would be ideal for lighting in a long drop stairwell or dining room. A lovely decorative ceiling light ideal for lighting rooms with a low ceiling. 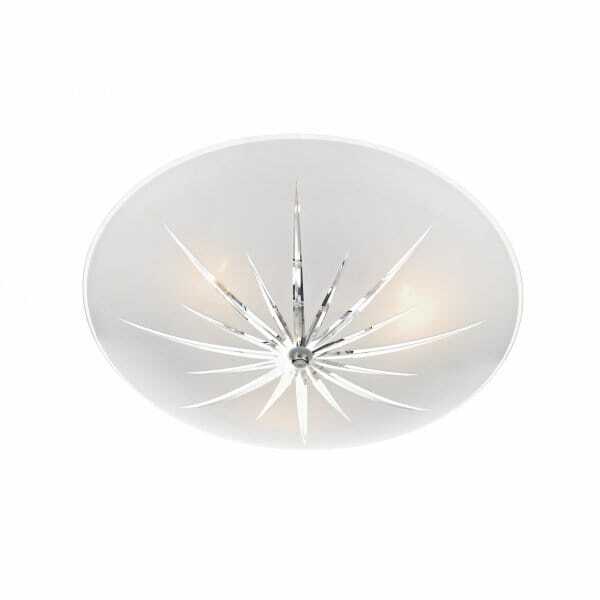 The Albany is a circular semi flush ceiling light in frosted glass with cut glass detailing in a star like pattern. Being neutral in colour it will work well with most colour schemes and as it only 18 cm down from the ceiling is a super low ceiling light fitting. It is fixed to the ceiling on a polished chrome rose and the up-lighter shade is supported on a short rod. The fitting can accommodate both low energy or standard bulbs which are hidden from view behind the frosted glass shade. Bubble glass is a popular form of lighting too, which allows the light to pass through the bubbles within the glass for an ethereal effect. 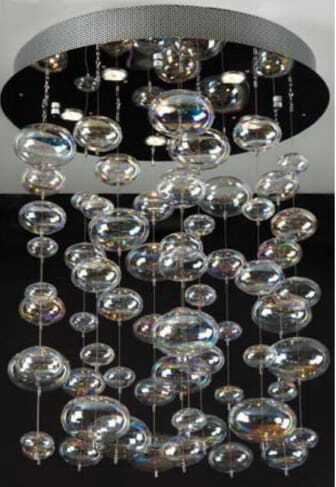 This modern ceiling light features a round polished chrome ceiling fitting which holds 6 recessed halogen lamps, there are numerous crystal bubbles suspended from this which each capture the light perfectly. 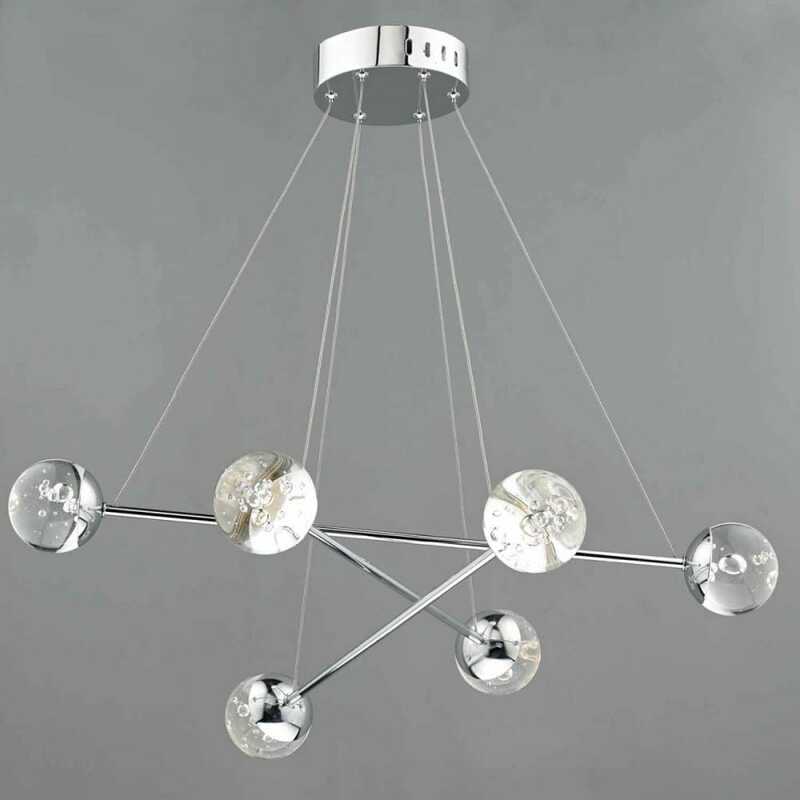 This is a very modern and decorative piece of lighting which would be ideal for use in any contemporary setting. A contemporary and decorative 6 light ceiling pendant with polished chrome arms and bubble effect glass sphere shades. The light is LED lit making it very low energy and each module is discreetly located within the bubble glass for a lamp-less light up effect. 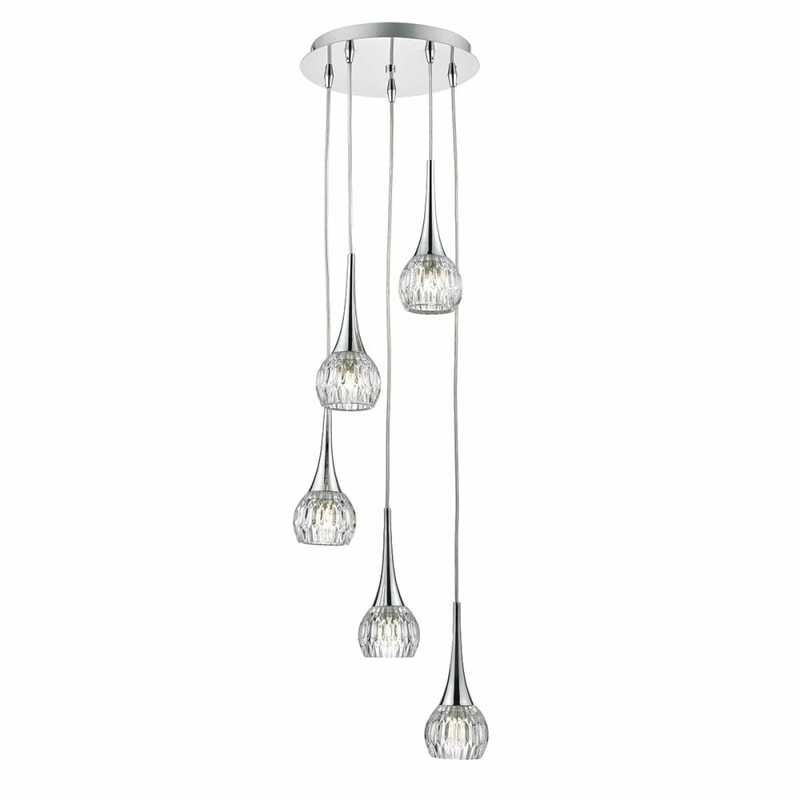 This would be great for lighting in modern settings and as a feature light in a dining room or long drop stairwell. 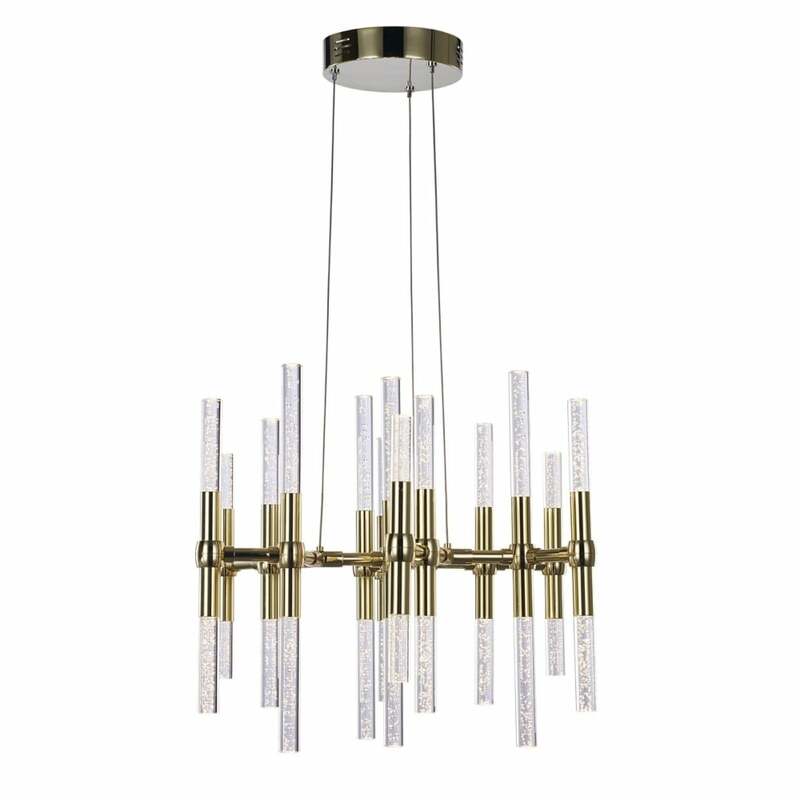 A decorative modern feature piece of lighting in a gold finish with clear bubble glass shades. The light is LED lit making it very energy efficient using a total of only 55 watts but providing around 3025 lumens or the equivalent of about 300 standard watts. The clear bubble glasses create a decorative sparkle effect that would be ideal for contemporary settings. The light is suspended on a cable suspension which can be shortened at the point of installation for use in rooms with lower ceilings, this would look great in a dining room or lounge. Crystal slices or rods are also an effective way to add a spot of sparkle to your lighting. The light shimmers through and the designs ensure that the styling is contemporary statement lighting whilst still maintaining a sleek and tidy architecture. A contemporary and decorative seven light ceiling pendant in chrome with tiered glass rods. The glass rods create a sparkle effect diffuser which is sure to add glamour to any living space. The light is suspended on a chain suspension which can be shortened at the point of installation for use in rooms with lower ceilings. 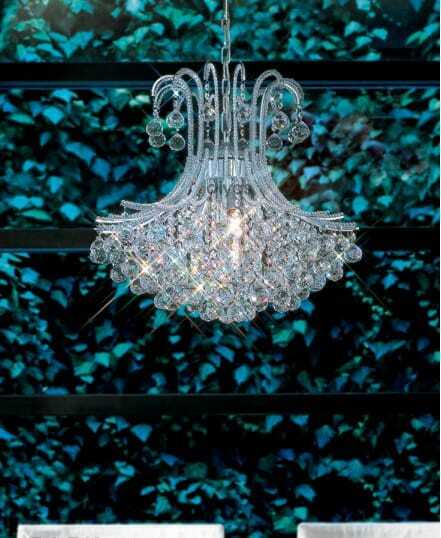 Crystal pendant light ‘Crystal Skye’ a luxurious elegant modern chandelier. A show stopper. The ring shaped pendant is covered in crystals cut in a triangular shape, which bounces and refracts light brilliantly. The underside too has crystals cut in a rounded prismatic shape. Crystal allows light to be split you can see colours and rainbow patterns even when daylight catches the crystal and brilliant sparkle under artificial light. It’s also very energy efficient as it comes supplied with LED G9 bulbs which use only 3.5 watts each but provide around 320 lumens or about 40 standard watts. The light can be shortened at the pint of installation if required. IP44 rated for safe use in a bathroom. Crystal beading within a framework works well with traditional and modern designs. For a simple look, these add sparkle whilst maintaining an orderly character. For added sophistication and adornment, you could choose your lighting with beaded crystal drops. 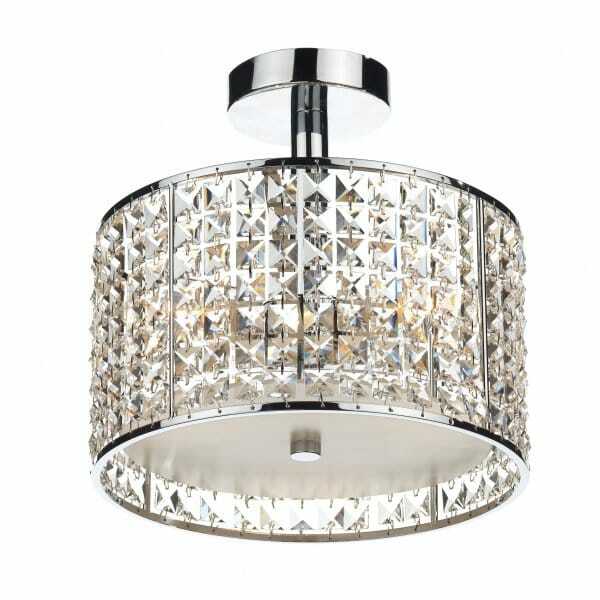 This bathroom ceiling light comes in a polished chrome finish with a crystal decoration shade, the light is IP44 rated for safe bathroom use and would be ideal for use in any contemporary bathroom. The light fits semi flush to the ceiling and would be suitable for use in rooms with low ceilings. 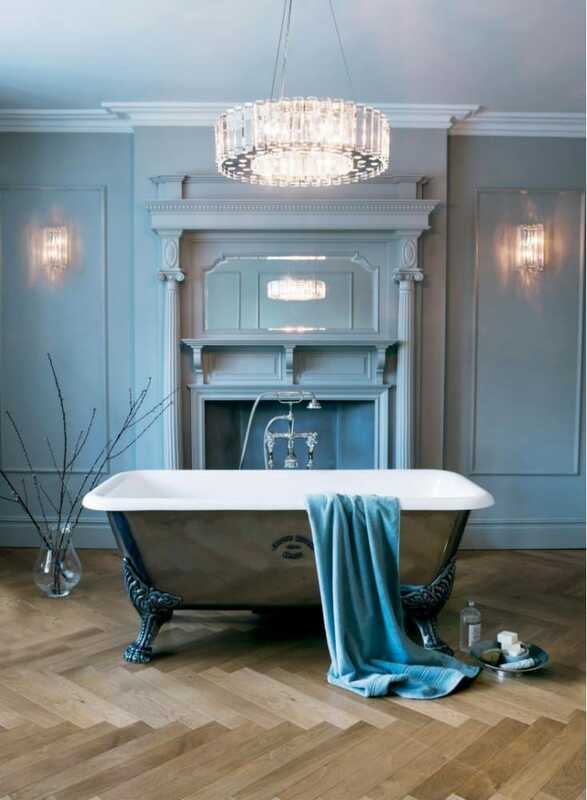 Add a bit of sparkle to your bathroom with this bathroom chandelier! 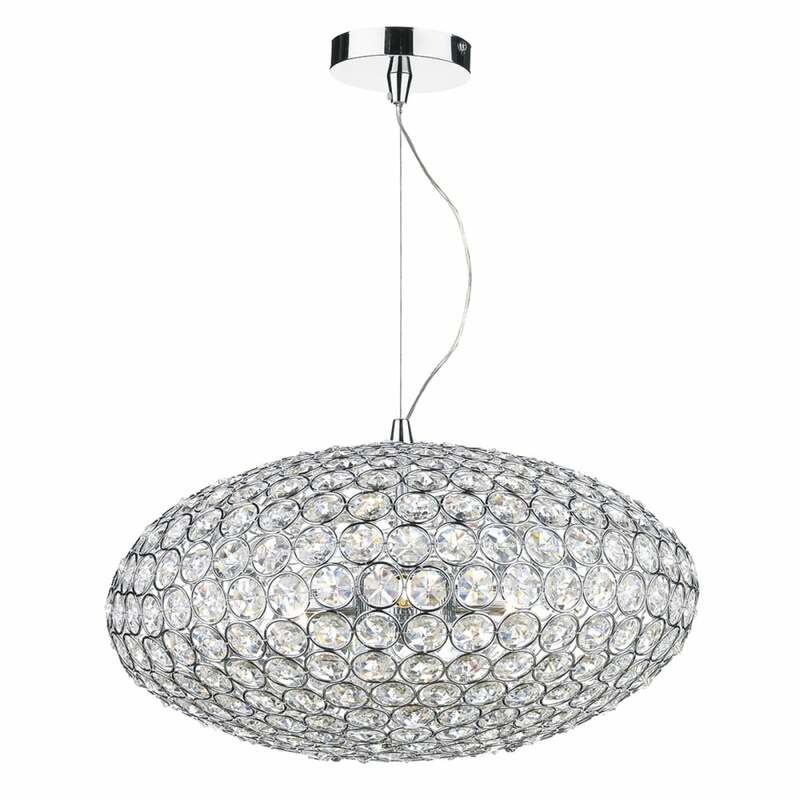 A beautiful chrome and crystal ceiling pendant with an elongated globe design. The faceted crystal beads and chrome frame are sure to add a luxurious sparkle to any contemporary setting. The suspension can be height adjusted at the point of installation for use in rooms with lower ceilings and would be ideal for lighting over dining room tables or in long drop stairwells as a feature light. To compliment your ceiling lights, there are a vast selection of table, wall and floor lamps that will carry your sparkle through the room. A superb quality ceiling chandelier which would make a stunning feature light. The chandelier is attached to the ceiling by a polished chrome rose and suspended on a link chain. The chain can be shortened when fitting to accommodate different ceiling heights. The polished chrome frame is richly decorated with faceted lead crystal trimmings. So, add a bit of sparkle into your home this Christmas. It will be sure to brighten up even the darkest of days, long after the decorations come down.